Abstracts and posters are generally thought to be placeholders for manuscripts. The value in posters is in helping you present your ideas at scientific meetings, meet new people, and think about how to craft your message. I am posting these because they are a record of my ongoing research work, some of which is not yet published in the peer-reviewed literature. I am pretty persnickety about my posters because I like graphic design. I think that the way a message is presented impacts how people receive that message. For that reason, I put a lot of time into creating my posters, and my designs have gotten more interesting over time. I retain the copyright for these posters, but would be happy to share tips. In this study, I interviewed 30 attending physicians across the United States to try to understand how they approached intensive care unit handoffs. This was my first foray into qualitative research. Following from the ICU attending interview study, I surveyed a national sample of academic intensivists to find out how they conduct handoffs and to help figure out how these handoffs ought to be conducted. 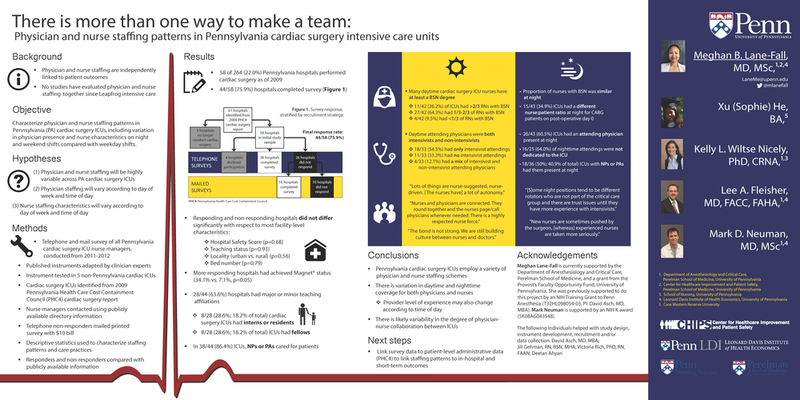 In this study, my team contacted all the cardiac surgery ICUs in Pennsylvania to find out about their staffing models. We linked this to an administrative dataset to determine associations between staffing models and patient outcomes. This project involved examining published data to examine demographic trends in critical care fellows over time. These are some of the multiple posters/abstracts from the HATRICC project. These posters focus on handoff problems in the absence of a standardized process, development of our process, and preliminary outcomes after handoff standardization.